(Jakarta, February 1st 2014) – Setting their standards to internationally high levels, Archipelago International recently held a training workshop for their General Managers and Hotel Managers, so that each professional gains the globally recognized CHA® certification, awarded by the prestigious American Hotel and Lodging Education Institute (AHLEI). CHA® is the most prestigious certification available to a hotel General Manager (GM) or Hospitality Executive. Globally recognized, the CHA® is a highly respected professional credential that validates a GMs advanced knowledge in the hospitality industry. It is an honor awarded to lodging professionals whose leadership and managerial abilities are exemplary. The CHA® certification is awarded by AHLEI - an elite training organization that combines education and experience to train hospitality professionals to high expertise levels. They are seen as some of the best in the profession, abreast of current trends and latest hospitality protocols, and they serve as leverage for current and future career opportunities for those GMs awarded with the CHA® certification. The workshop organized by Archipelago International was held from the 13th January to the 17th January 2014 at Aston Kuta Hotel & Residence Bali, and was attended by the General Managers and/or Hotel Managers of all of Archipelago International's properties in Bali (a total of 14 GMs). The awarded certificates will be valid for five years and are available for re-certification once the validity expires, based on the qualification and accomplishments of the individual GMs. Archipelago International will continue to hold these workshops for all of their GMs within the group, with the next program set to be held in Jakarta. 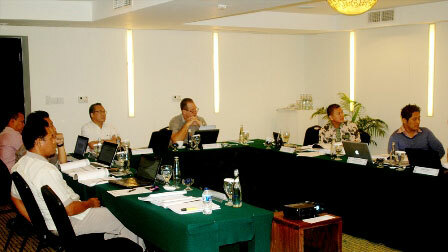 “As the leading hotel management company in Indonesia, we plan to have all of our GMs CHA® certified by AHLEI. We now have 76 hotels under 11 brands, so to have all of our GMs at this high level of competence with this globally recognized professional status would be a great achievement. We not only aim to be the leading hotel management company in Indonesia, but the leading hotel management company with the most CHA® certified GMs and Hotel Managers.” Said John Flood, President & CEO of Archipelago International. Archipelago International hotels operate under the hotel brands Grand Aston, Aston, Aston City, Alana, Harper, Quest, favehotels, NEO and Kamuela, ranging from ultra-luxurious private pool villas to serviced apartments and select service economy class hotels, thus offering Indonesia’s vastest and most comprehensive hotel network.